Waitrose has unveiled plans to take a bigger share of the convenience store market, saying it could potentially open up to 300 smaller format shops. It is also planning to get a selection of its products in branches of Boots and Welcome Break service stations as it tries to reach a broader audience. 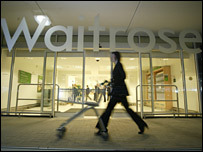 Waitrose has introduced a lower-priced range of food as it battles for increasingly cash-conscious consumers. Last week it reported a 15.7% rise in first half profits to £121.1m. The company, part of the John Lewis Partnership, has about 215 stores across the UK. But it believes there are about 6.5 million potential customers who do not live close to one of its outlets. Waitrose has opened two convenience stores - in Nottingham and Bristol - and is planning two more, in North London and Oxted, Surrey. However, it believes there is potential for up to 300 of the smaller format outlets. The measures aimed to improve access to its goods, said managing director Mark Price. The partnership with Boots is set to lead to trials of selling the two firms' goods in each others' stories. Also, in-store pharmacies in 13 Waitrose shops are in the process of being re-branded as Boots. The franchise deal with Welcome Break has seen Waitrose open shops in two service stations, with plans for a further nine. Earlier this month, Waitrose struck an agreement with The Prince of Wales' Duchy Originals food label to exclusively stock its range. Rival supermarkets such as Sainsbury and Tesco have been rapidly expanding their number of convenience stores. Marks & Spencer has also opened Simply Food stores, although some of these were closed as they struggled in the downturn. Retail analysts IGD say that the convenience store market has grown by 6.1% in the past 12 months, outpacing the overall grocery market.